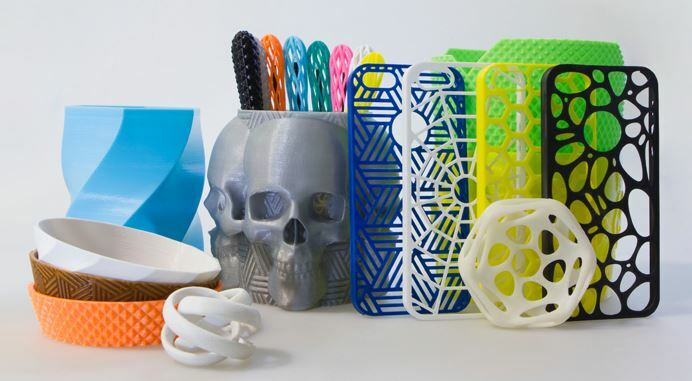 3D Printing Forum • View topic - What are all the materials used as a medium for 3d printing? Board index ‹ Topics ‹ Tips & Tutorials ‹ What are all the materials used as a medium for 3d printing? What are all the materials used as a medium for 3d printing? Post your tips here to help more users. Polyamide (nylon 3d printing fdm material and its variants: glass filled polyamide, carbon filled, alumide), photopolymers (lots of them), resins (many different types), nanocomposite resins, ABS (also variants including blends), polycarbonate, foundry sand (such as quartz), any sand, arcylics (other than photopolymers), glass, wood, aluminium, cobaltchrome (lots of variants), stainless steel, steel alloys and variants, nickel alloys, titanium (lots of variants including with vanadium etc. ), bronze (and alloys, variants, combinations) gold, inconel, maraging steel, polysterenes, bone, starches (PLA and many others besides), plaster, ultem, ppsf, paper, cordierite, lots of thermoplastics and human tissue. If you look at Zcorp for example its just a question of using glue to stick powder together. So give a Zcorp machine any fine powder and it will to some degree work. I'm glad you asked this question because I think it is crucial for understanding the potential of this technology. As the industry grows more and more people will realize that their materials research produces materials that can be used for 3D printing. These new materials could be tested easily and then quickly introduced to the market including the installed base of 3D printers. The fact that 3D printing reduces manufacturing to one two factor process: a material and a machine means that the ecosystem that is created by the technology is readily accessible by anyone. Just by a printer, feed lots of materials into it and eventually one will work. And when it does you can sell it to anyone with that printer. So, I would anticipate many more 3D printing materials in the future. Polyamide (nylon 3D printing fdm material and its variants: glass filled polyamide, carbon filled, alumide), photopolymers (lots of them),resins (many different types), nanocomposite resins,ABS(also variants including blends), polycarbonate, foundry sand (such as quartz), any sand, arcylics (other than photopolymers), glass, wood, aluminium, cobaltchrome (lots of variants), stainless steel, steel alloys and variants, nickel alloys, titanium (lots of variants including with vanadium etc. ), bronze (and alloys, variants, combinations) gold, inconel, maraging steel, polysterenes, bone, starches (PLA and many others besides), plaster, ultem, ppsf, paper, cordierite, lots of thermoplastics and human tissue. This is interesting information. Now I am looking for an opportunity to make branded gaming chips for home poker and I am very interested in the question of materials. My friends and I practice a lot on dice casino game but would like to arrange a small tournament at home. I don't like children's options for gaming chips from the store and I would like to come up with something of my own. Which of the following materials will suit me the most?